Pre-Ramadhan family picture. Aug 31st 2008. Is it a wonder that I love them so much? This entry was posted in family on August 31, 2008 by Eva. Love. And this time, she hopes it is the Divine Love. This entry was posted in personal, trip on August 27, 2008 by Eva. Translation: Pay attention to your belongings. I read the sign at a toilet in some shopping mall in town. This entry was posted in just that on August 24, 2008 by Eva. * Develop and update program descriptions, accomplishments and highlights for program outreach, including brochures and website. * Assemble and end draft program quarterly reports. * Develop and maintain internal networks to identify and document success stories. * Generate monthly highlights and quarterly program newsletters. * Develop and maintain digital photo library. The ideal candidate will have desktop publishing skills, including layout and graphics, to produce polished in-house publications, including quarterly program newsletters for public dissemination. This position requires fluent English and excellent writing skills. Indonesian languages skills are a plus but are not absolutely required. Applicants should submit CV highlighting relevant skills and accomplishments, and one or more sample publications (PDF format preferred; try to avoid attachments larger than 2MB). CV should list any weblinks to additional publications, or websites which contain content you have authored. We prefer to fill this position full-time, but may also be willing to consider candidates who prefer only part-time employment. This entry was posted in job op on August 21, 2008 by Eva. Taken from the song Loneliness, by Annie Lennox. Coupled with Irene Cara’s Own My Own, U2’s The First Time, and Annie Lennox’s The Hurting Time, they were an intense combination. Reminiscing the past. Wondering whether I am completely over it. This entry was posted in personal, quote on August 18, 2008 by Eva. This is it. The end of my current stretch of travel. Tomorrow, the work life (as a professional in the communications field) will resume. It has been a great three week journey. I had never thought about that until she said it. She has made a valid point. If you look at the schedule, my life seems to be moving very fast from one point to another. Yet interestingly, at each point, the life seemed to slow down up to the degree where it hardly even moved. The life was slow at each point. It took its time going through and enjoying the process. Now life does not seem as if it is moving that fast at all. Not anymore. The life moves from one point to another lightly, but I know it takes its time as it moves–immersing in the experience given by each node of adventure, enjoying the process, and embracing the learnings presented by nature. Detaching, enjoying, and embracing seem to be the keywords of this travel episode. I have my teachers and friends to thank. And God. 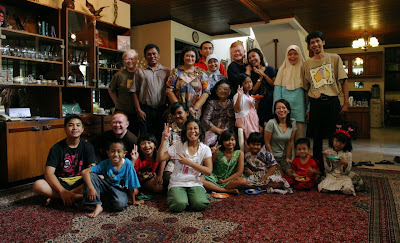 And my beloved family. And–in a peculiar way—I have myself to thank for allowing the process to happen. PS: miss you, too. I really do. This entry was posted in personal, quote, trip on August 10, 2008 by Eva.